Joseph B. Tipton, Jr., Ph.D.
More in-depth information about my research history can be found in the links below. My work at Oak Ridge National Lab in 2011 was featured in a Faculty Research Profile that you might find informative. In the broadest sense, my research interests are in the application of numerical methods to solve unique problems in the cooling of structures under high heat loads. My doctoral research focused on the numerical analysis of micro- and nano-scale fluid evaporation and condensation. Specifically, I modeled the steady evaporation of a capillary pore with a liquid metal working fluid. This included the nano-scale region where atomic dispersion forces combine with electronic disjoining pressures to create a region of extended meniscus evaporation. The thin film model was then spliced with a CFD model of the evaporating bulk meniscus to create a multi-scale model of the total evaporating capillary meniscus. This research was funded in part by the Air Force Office of Research with interest in the cooling of leading edges in hypersonic vehicles. Since joining the teaching profession, my research has centered around the design and simulation of thermofluid effects in the cooling of fusion reactor components. This work has been performed under the auspices of the ORNL Fusion Energy Division through the ORNL HERE program. During the summer of 2010, I performed research on the design of the Dual Cooled Lithium Lead (DCLL) Thermal Blanket Module (TBM) for an experimental fusion reactor to extract heat for power generation and to breed the hydrogen isotope tritium for fuel production. This included ANSYS CFX® simulations to model helium gas coolant flow with rib roughened surfaces to enhance heat transfer. During the summers of 2011 and 2013, I combined ANSYS CFX® with commercial optimization software (VR&D VisualDOC) to pursue optimal cooling configurations for the Fusion Nuclear Science Facility (FNSF) Spherical Tokamak centerpost. In addition, I performed a preliminary cooling design and analysis for a protective scraper element in the Wendelstein 7-X Stellerator in Greifswald, Germany. This included ANSYS CFX® simulations to model twisted tape heat transfer enhancement. Computational model uncertainty was estimated using the ASME Validation and Verification Performance Test Code 19.1-2005. During the summer of 2012, I used the LS-DYNA explicit finite element analysis software package to model shattered pellet injection concepts for the ITER disruption mitigation system. This included significant research into available material properties for solid Deuterium. In addition, I used ANSYS CFX® to model scenarios for in-situ baking of blanket components in the ITER tokamak. Since the summer of 2015, I have been working with the US ITER program to design cooling systems for the Electron Cyclotron Heating (ECH) Transmission Lines (TL) for the ITER experimental fusion reactor. I am using ANSYS Multiphysics® software to design, analyze, and optimize cooling systems for ECH TL components. This includes using both finite volume method (ANSYS CFX®) and finite element method (ANSYS Mechanical®) programs to develop and verify the fluid, thermal, and structural behavior of the components. In the future, my research goals are to continue using CFD to model and design cooling systems for high heat load applications. I believe that my unique CFD skills including micro-scale evaporation, surface roughening, optimization, and simulation validation and verification will allow me to contribute to ORNL’s energy research needs and goals. For this fourth summer it was my pleasure to work at ORNL with Dr. Arnold Lumsdaine in the Fusion Energy Division (FED) at Oak Ridge National Lab (ORNL) through the Higher Education Research Experiences (HERE) Program for Faculty. During this time I contributed research on cooling systems for experimental fusion reactors. Part of my work concerned a cooling system for the Electron Cyclotron Heating (ECH) Transmission Lines (TL) for the ITER experimental fusion reactor. The device is currently under construction in France, and the ECH TL system must be cooled using water from a Component Cooling Water System (CCWS) circuit. The design team became concerned about the possibility of copper corrosion and erosion from high velocity water. I performed an extensive literature review on water chemistry effects on corrosion. My report was published in a technical memo for senior project management. Another part of my work concerned a scraper element (SE) cooling system for the Wendelstein 7-X (W7-X) Stellerator. W7-X is another fusion experiment that is currently under construction in Greifswald, Germany. The ORNL FED is contributing to this project with the design of scraper elements for the plasma edge in the reactor. The scraper elements will experience high plasma heat loads and need to be actively cooled. The cooling channels will use twisted-tape inserts to swirl the flow and enhance heat transfer. I used ANSYS CFX® computational fluid dynamics (CFD) software to model flow and heat transfer through the swirl tubes. Using my simulation results, I co-authored a paper that was submitted to a peer-reviewed journal. During my third summer at ORNL, I worked with Dave Rasmussen in the US ITER office through the Higher Education Research Experiences (HERE) Program for Faculty. ITER is a multinational effort to build a large scale fusion power experiment. Construction is currently underway in the European Union, and ORNL is leading the US contributions. During my visit, I provided contributions to two subprojects. First, I attempted to model shattered pellet injection (SPI) for the ITER Disruption Mitigation System (DMS). The ITER tokamak must endure transient oscillations that, left alone, would cause significant thermal stresses and electron beam discharges. One proposed solution is to inject massive amount of atoms into the plasma in a rapid manner. This could be performed by shooting a pellet of frozen deuterium onto a shattering plate to disperse the fragments into the plasma field. The Fusion Energy Division (FED) had obtained a license for the LS-DYNA explicit finite element analysis software package, and wanted to try and model the SPI process. Over the course of the summer, I learned to use the software which included developing appropriate material models for shattered deuterium similar to high speed ice impact in the aerospace industry. The results of my analyses were compared with experiments that shot deuterium pellets into a funnel-shaped ram at high velocities. Second, I used my knowledge of Computational Fluid Dynamics to advise the chief engineer in the US ITER office. The components inside the tokamak pressure vessel must be baked at high temperatures to allow the off-gassing of impurities. The only way to do this is by forcing high temperature, high pressure water through the cooling channels. The US ITER office is proposing that this be accomplished using a smaller coolant loop to save considerable operations cost. The unanswered question, however, is whether this can bring the system to a high enough temperature in the alloted timespan without creating large thermal stresses. I created a CFD model of the first-order effects that natural convection will have on the gas inside the tokamak. The US ITER office is using this information to direct further modeling and inquires. For the second summer in a row, it was my pleasure to work at ORNL with Dr. Arnold Lumsdaine in the Fusion Energy Division (FED) at Oak Ridge National Lab (ORNL) through the Higher Education Research Experiences (HERE) Program for Faculty. During this time I contributed research on cooling designs for components on two experimental fusion reactors. The Fusion Nuclear Science Facility (FNSF) is a proposed experimental fusion reactor based on a spherical tokamak design. The centerpost is a critical component of the spherical tokamak design and will experience high external (plasma) and internal (electrical, nuclear) heat loads. A major design challenge is to optimally design the water cooling channels in this region to minimize the peak steady-state temperature. I sought to develop the capability to find an optimal design. Specifically, I used the Python programming language to connect commercial computational fluid dynamics (CFD) software (ANSYS CFX®) with commercial optimization software (VR&D VisualDOC®). The script I constructed allows a full thermal/fluid analysis of the centerpost while varying size, number, and location of the cooling channels. The Wendelstein 7-X Stellerator is another experimental fusion reactor that is currently under construction in Greifswald, Germany. The ORNL FED is contributing to this project with the design of scraper elements for the plasma edge in the reactor. The scraper elements will experience high plasma heat loads and need to be actively cooled. I contributed a preliminary design of the cooling system that meets fluid flow and heat transfer limitations. I also used the ANSYS CFX® CFD software to determine temperature profiles on this preliminary design when the cooling channels are enhanced with twisted tape inserts. I presented preliminary results of my research on August 1, 2011 at the ORNL Fusion Energy Science & Technology Seminar. Results from the FNSF optimization study were presented at the International Symposium of Fusion Nuclear Technology (ISFNT) conference in Portland in September, 2011. This also led to a research article in Fusion Engineering and Design. Further publications are listed above and in my CV. During the summer of 2010 it was my pleasure to work at ORNL with Dr. Arnold Lumsdaine in the Fusion Energy Division at Oak Ridge National Lab (ORNL) through the Higher Education Research Experiences (HERE) Program for Faculty. I performed research on the Dual Cooled Lithium Lead (DCLL) Thermal Blanket Module (TBM) design. 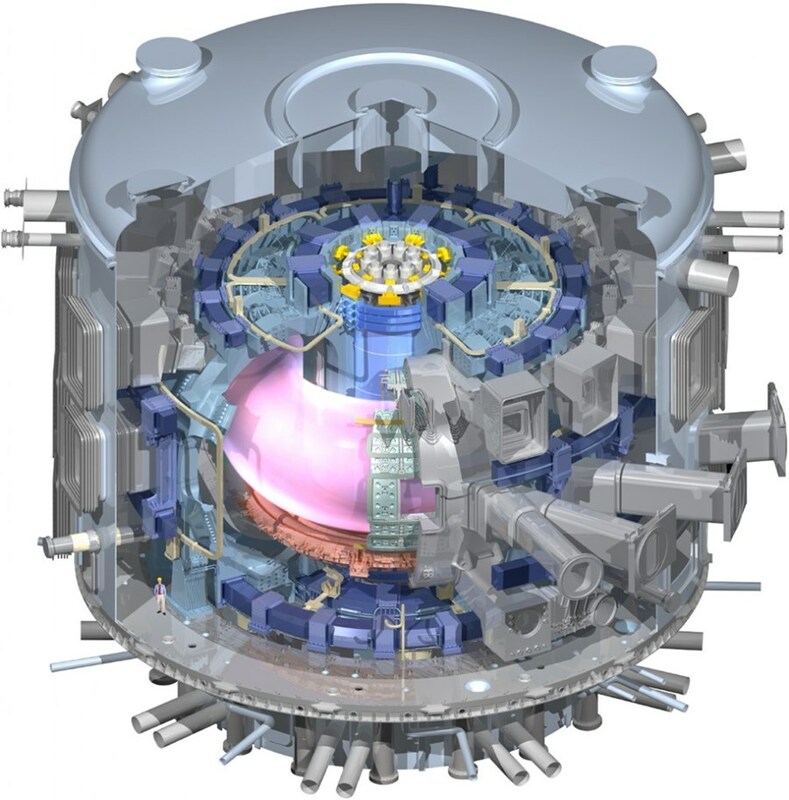 The DCLL TBM is intended to be inserted into a test port in an experimental fusion reactor to extract heat for power generation and to breed the hydrogen isotope tritium for fuel production. I was brought in to aid in the modeling of heat removal in the test blanket module using computation fluid dynamics (CFD) software. The current design is complex with many parallel square channels connected by manifolds through which helium gas will flow as a coolant. The gas will need to transfer a substantial amount of heat generated by both nuclear neutron heating of the solid support structure as well as a high incident heat flux from the plasma in the fusion reactor. In an attempt to build the capabilities for running simulations of the larger model to optimize flow and heat transfer, I first validated the ability of the commercial ANSYS CFX ® code to accurately predict fluid and heat flow through representative channel geometries and boundary conditions. My second task was to explore options to model wall surface roughening. Specifically, the current design places small repeating rectangular ribs along one surface of the flow channel to augment convective heat transfer in the hottest region of the TBM. I explored three possible options: (1) equivalent sand grain roughness wall modification, (2) modeling fluid friction and heat transfer effects using published semi-empirical correlations, and (3) direct modeling of rib roughening in the TBM channels in ANSYS CFX ®. The results of my research were presented in a poster session at the 19th Topical Meeting on the Technology of Fusion Energy, held by the American Nuclear Society in Las Vegas on November 7-11, 2010. Preliminary results were already presented at the Fusion Nuclear Science and Technology (FNST) Meeting at UCLA on August 2-6, 2010. Past research dealt with experimental studies of nanofluid droplet evaporation using a microheater array as well as nanoparticle thermophoresis. Dissertation research focused on the understanding and numerical modeling of high temperature, liquid metal, thin film evaporation. Research was funded by NASA and the Air Force Office of Research. C.H. Chon, S.W. Paik, J.B. Tipton Jr., and K.D. Kihm, "Evaporation and Dryout of Nanofluid Droplets Heated by a Microheater Array", Journal of Heat Transfer, Photo Gallery, Vol. 128, 2006, p. 735. Joseph B. Tipton Jr., Kenneth D. Kihm, and David M. Pratt, "Modeling Alkaline Liquid Metal Evaporating Thin Films Using Both Retarded Dispersion and Electronic Force Components", Journal of Heat Transfer, Vol. 131, 2009, 121015 (9 pages). H. Yi, J. Tipton, K.D. Kihm, D.M. Pratt, A.D. Swanson, S. Rawal, "Effect of disjoining pressure (Π) on multi-scale modeling for evaporative liquid metal (Na) capillary", International Journal of Heat and Mass Transfer, Vol. 78, 2014, pp. 137–149. Joseph B. Tipton Jr., "Unique Characteristics of Liquid Metal Extended Meniscus Evaporation," Ph.D. Thesis, The University of Tennessee Knoxville (2009). From the Summer of 2005 until my graduation in August 2009, I worked in Dr. Kenneth Kihm's Micro-Nano Scale Fluidics and Energy Transport (MINSFET) lab in the University of Tennessee Science and Engineering Research Facility (SERF) building. In my initial research, I collaborated with two other lab members to study the evaporation and dryout of nanofluid droplets. We used a microheater array fabricated by Dr. Sokwon Paik to spatially and temporally resolve heat transfer in an evaporating droplet of nanofluid. Our work has applications in electronic cooling and nano-lithography and resulted in two published works. You can click on the graphics below to access the publications. erences in thefilm thickness and evaporation profile. Second, the extended meniscus thin film model is spliced with a CFD model of the evaporating bulkmeniscus. The result is a multiscale model of the total evaporating capillary meniscus with a nonisothermalinterface and non-equilibrium evaporation. Integration of the evaporative mass flux across the total meniscussurface area produces total capillary evaporative mass flow rates and enables comparisons between electronicdisjoining pressure states. The clear trend from these comparisons is that a larger electronic component ofthe disjoining pressure leads towards larger extended meniscus thin film surface area, larger total capillarymeniscus surface area, and larger net evaporative mass flow rate (which corresponds with larger heat flowrate, as well). Finally, an outline is presented of the scope of the general problem in the application of nonlinearstability theory to a liquid metal evaporating thin film. Served during 2001-2002 as project manager for an undergraduate two-phase flow, microgravity experiment that flew aboard NASA's KC-135 "Weightless Wonder." Accomplished research that simulated forced convection film boiling in microgravity and ascertained how static mixer geometries affected heat transfer to fluid. M. Parang, J.B. Tipton, and J.D. Garth, "Two-Phase Flow Heat Transfer Under Microgravity Condition," in 41st Aerospace Sciences Meeting and Exhibit, Reno, Nevada, 6-9 January 2003, AIAA 2003-1302. Viatcheslav Naoumov, Masood Parang, Christopher Shough, and Joseph Tipton, "Droplet Entrainment in Two-Phase Flow Under Reduced Gravity," in 45th Aerospace Sciences Meeting and Exhibit, Reno, Nevada, 8-11 January 2007, AIAA 2007-743. Tipton, Joseph Brown, "MAMMOTH Flow: Making a Mixing Measurement of Two-pHase Flow" (2002). University of Tennessee Honors Thesis Projects. "The Reduced Gravity Student Flight Opportunities Program provides a unique academic experience for undergraduate students to successfully propose, design, fabricate, fly and evaluate a reduced gravity experiment of their choice over the course of six months. The overall experience includes scientific research, hands-on experimental design, test operations and educational/public outreach activities. From 2000-2002, I was a founding member of a group of students from UT who participated in this program as an extracurricular activity. In 2002, I served as project leader for the group. Our desire was to augment our undergraduate education with a "real" engineering experience. In the process, we brought great publicity to the UT College of Engineering and established the NASA RGSFOP as a viable senior capstone design course for the mechanical engineering program. Our research sought to simulate film boiling (an unwanted engineering scenario) in a pipe under forced convection. Several geometrical pipe changes were then used to mix the separated two-phase flow in an effort to augment heat transfer in microgravity conditions. These devices were compared both qualitatively and quantitatively to a smooth pipe configuration to ascertain their effectiveness. More information, including the final report, can be found here. The project offered many opportunities for educational outreach, as NASA intended. Above, I am explaining microgravity research to a group of middle school students during the UT College of Engineering 2002 "Engineer's Day". Below are several publications produced by the University of Tennessee that featured my work. Click on them to view the larger document. © 2019 Joseph B. Tipton, Jr.